Administrative assistants are tasked with many different assignments from day to day and most often these duties depend on the business and people they are employed to assist. Being savvy and up to date on the latest business technology is a huge advantage to anyone, but can be especially helpful for administrative assistants. Technological competence includes skills like efficiently and concisely providing information in an organized fashion to superiors, coworkers and clients. One of the most powerful tools that an administrative or executive assistant can master is Microsoft Excel. 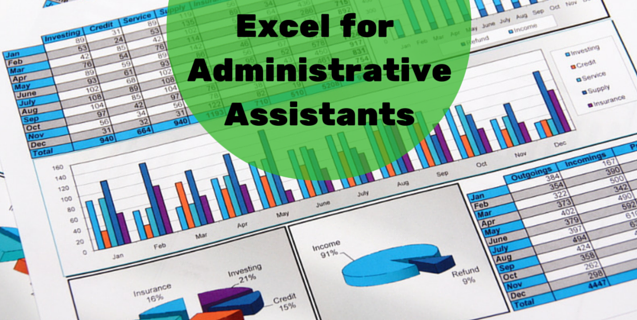 Here are just a few ways Excel for administrative assistants can be an indispensable ally. The most important function of a good assistant is the ability to compile and present valuable data to management, helping them make good decisions based on facts and data analysis. Excel provides a number of ways to gather data from multiple data sources. It can do a whole lot more than just provide a good spreadsheet to type in numbers. Data can be imported from text files, databases, and even web sources and once gathered, this information can be analyzed, organized and presented in a meaningful way to decision makers. Another important aspect of being an assistant is organization and Excel is one of the most powerful tools for organizing data. Being able to sort and filter data can impact how quickly and easily people consume information. The ability to shift data into an easily readable format is a skill that every administrative assistant should have because it can help to increase the efficiency and success of the whole office. By obtaining training in Excel for administrative assistants, anyone can streamline activities like basic accounting, contact information management, presentation building and other valuable tasks. Communication is also an important skill to master. Excel provides tons of features that will help in building relevant, meaningful and easily understandable presentations. Building formulas, charts, three-dimensional worksheets and other forms of visual representations serve to communicate findings from data that’s been gathered and organized using Excel. The conveyance of this information can come full circle from inception to consumption by using Excel. Efficiency and productivity are vital in any position but are highly valuable for an administrative assistant. Learning shortcuts and using macros to automate repetitive tasks help to process information quickly and reduce manual workloads. Building templates and formatted worksheets are also ways in which repetitive data gathering jobs can be quickly automated making the assistant, and entire office, more efficient and productive. Learning to be an indispensable team member is the best way to open up new opportunities in any position. Administrative assistants can utilize Microsoft Excel in almost every aspect of their job. Whether it be records management, coordinating meetings and travel, office logistics, or space planning, Excel offers high-powered features that will aid an administrative or executive assistant in their daily duties. Mastering these Excel techniques will help them become an invaluable team member.